In case you haven't noticed already, Blizzard has just posted a Teaser Timeline on their homepage to countdown to their next game announcement on the 19th of this month. Take a look! From the color scheme and style of the design, it looks very Starcrafty to me. Aside from the fact that Starcraft is the only game on there without a sequel, those vertical blue scanlines just scream of sci-fi. What do you guys think? Are they just trying to throw us Diablo 3 hopefuls off or is this further confirmation that another Starcraft is coming up next? Or will the long-rumored Tacocraft finally be unveiled? Also, with the countdown to the Blizzard game announcement on, we would like to remind all our guests to register on the message boards and join the other 12,000+ Diablo3.com members in the countdown. This will also ensure that you are notified via email once the big announcement is made. So become part of the community now, click here to register on the Diablo3.com message boards. I don't think there are any predominant hints, but they are definately trying to mess with our minds, that's for sure. And blue lines? Isn't everything with Blizzard blue? Yeah their logo is blue 'n all, but I still think that's just too "techy" of a design to be something for Diablo 3, unless they're simply trying to throw everybody off. I also think there would be riots in Korea if they announced anything besides a new Starcraft. Yeppers, I actually started the site way back in the day and it's gone through a bunch of changes over the years. Umaro is the co-webmaster because I can't dedicate all of my time to this site and it definitely deserves that kind of attention. So with his help, the two of us try to run a smooth ship (along with the moderators of course). You neve noticed the "Administrator" under his name? In regards to how the design is, I would have to agree though that it looks more like a Starcraft theme. But that might just be me and my mind making me see what I want to see. we are like a family here. If its tacocraft, then ill go buy 100 tacos and videotape myself eating them. there is a good chance its diablo, looking at the background image it looks like molten rock, the type yo would expect to find in HELL! As regarding the blue lines. if you go on battle.net you will notice that all planets are in blue lines, even the DIABLO PLANET! However, the molten rock could be the type found on that protoss planet -__- give us diablo 3 FFS! i assume its just a joke of some sort. though i have hear a lot of it. you have to ask yourself 1 question how badly do you want diablo3? i noticed something that looked hidden in the picture, if you look on the left it resembles a Protoss's body armor and on the right it resembles a Marines shoulder pad. maybe theres a secret message in the picture? I'd say that they made it so that its a neutural design, which does not actually have any hints at any one world. That would be the smart thing to do. They probably figured that you would try to make something out of it anyway, no matter what they did. Which is true. But yeah, somehow I think that its starcraft. Also considering the recent patch update for starcraft. Okay, see the image below? I think it's pretty obvious that this is the image seen in the background of http://blizzard.com/images/splash/day2.jpg. You can clearly see the claws both to the left and to the right. Wow you're good, and right, and good. MAN I want diablo3, if diablo3 is announced on the 19th, I'll get the new box cover tattoo'd on my back. u sir are my hero. So you're saying the first image is a close up of the second? I'm not quite getting what you're saying. The second image is just the first Diablo box art..
notice it goes WC, WC, D, SC, D, WC, WC, ??. we waiting for Diablo? after all, we did get diablo after two times of WC, unless they try to throw us off by switching D and SC. 1,2,3,4, and 9 are what we should be interested. notice these are in color, while 5-8 are transparent. what does this mean? maybe a patern of current and future consentration upon franchises that made them what they are? 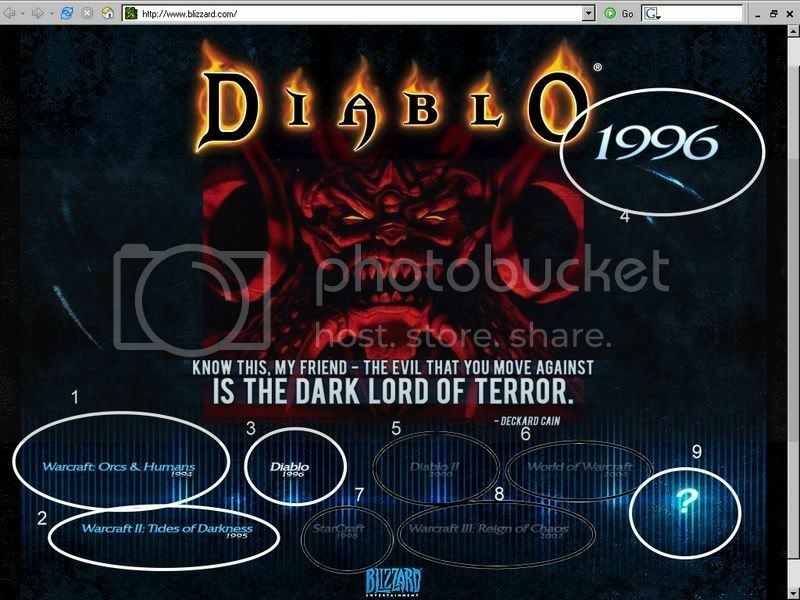 i didnt circle it, but notice the diablo pic. why would they choose diablo 1? and then they went through the trouble of adding cain's words to it. the background theme is the blizzard theme. go to battle.net and you'll see what i mean. i think that this is mounting evidence towards a diablo 3. if you go to battle.net, you will see that SC has a new patch coming. why would blizzard want SC players to get comfortable with a new patch? The first thing I did when I saw this splash-screen was to examine the html of the page. It contains a reference to the image http://blizzard.com/images/splash/day2.jpg. So, I figured, "why not try with another number after day?". Thus, I tried http://blizzard.com/images/splash/day1.jpg, and voila! A picture of the first two games in the timeline below. Today, the name of "Diablo" is highlighted, while the first to games are in light blue, because they have already been displayed. The rest of the games are in dark blue, because the have yet to be displayed in the picture above. So, tomorrow the image http://blizzard.com/images/splash/day3.jpg will be active, and it will most likely display something from Starcraft (the next game in the timeline). Also, the name "Diablo" will be in light blue, and "Starcraft" will be highlighted. after checking this out, ill have to agree with you on that. good pont.